This ground beef enchilada recipe is filled with grass fed ground beef, sautéed chopped yellow onions, pinto beans, enchilada sauce, freshly shredded cheddar cheese and topped off with sliced olives and chopped spring onions. Such a perfect comfort food. I’ll admit it, I love flour tortillas. For awhile I was avoiding them because I thought we should all be eating corn tortillas since they’re “healthier”. But, sometimes, like with this beef enchilada recipe, flour tortillas work best in giving this dish a beef enchilada casserole feel and taste. The tortillas become so soft while cooking and soak up the red enchilada sauce perfectly. So good. I used pinto beans, but you can also use black beans if you wish. Pour the red enchilada sauce so that it covers the rolled enchiladas almost completely. Freshly grated cheddar cheese and grass fed ground beef kick the taste up a few notches. This has been voted by my family to be the best beef enchilada recipe with flour tortillas in our vault of dinner recipes. Luckily for me, its super easy to make and I can deliver to the table in a flash. Easy ground beef enchilada recipe with red sauce that is so quick to throw together for a healthy weeknight meal. Add tablespoon oil to large skillet and cook beef and chopped onions over medium heat until meat is no longer pink. Drain excess fat from skillet. Stir in the can of beans, 1/2 cup fresh salsa, and one can of the red enchilada sauce. Place 2/3 cups of the beef mixture in a flour tortilla with a sprinkle of cheese, then roll up tortilla. Place rolled, filled tortilla seam side down in a greased 13x9 inch baking dish. Repeat with the rest of the 8 tortillas. 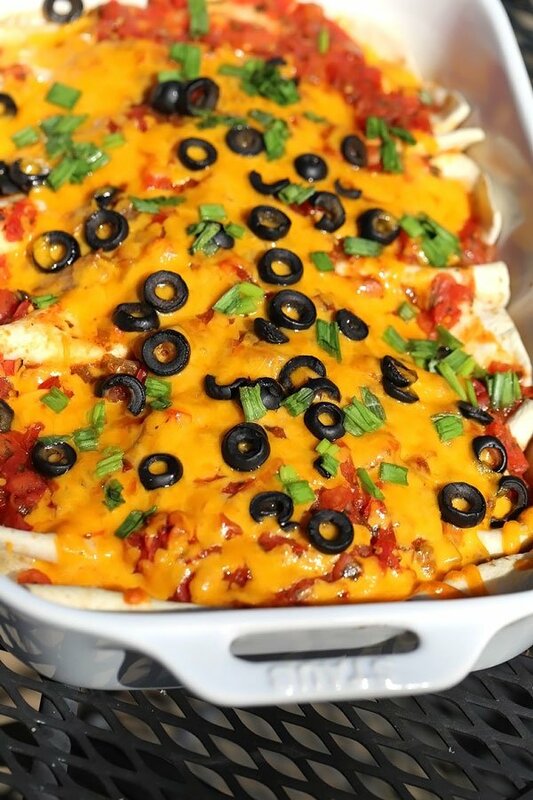 Pour the second can of red enchilada sauce over the rolled enchiladas, then sprinkle the rest of the shredded cheddar cheese, followed by chopped spring onions and sliced black olives. Cook for 20-25 minutes in a 350 degree oven. 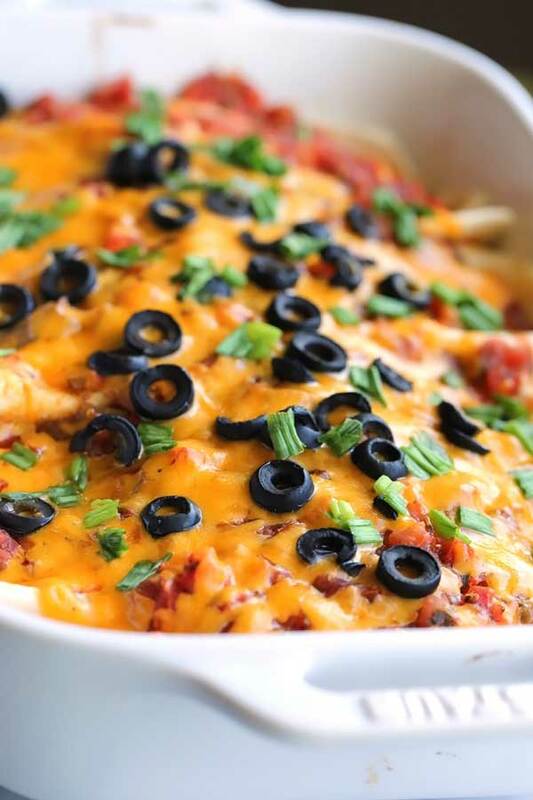 Leftovers of this dish are fabulous the next day. Store in the fridge with plastic wrap tightly around the top of the dish to retain freshness. Note: Make Ahead Freezer option. After step 4, place aluminum foil tightly over your dish, and place in freezer. 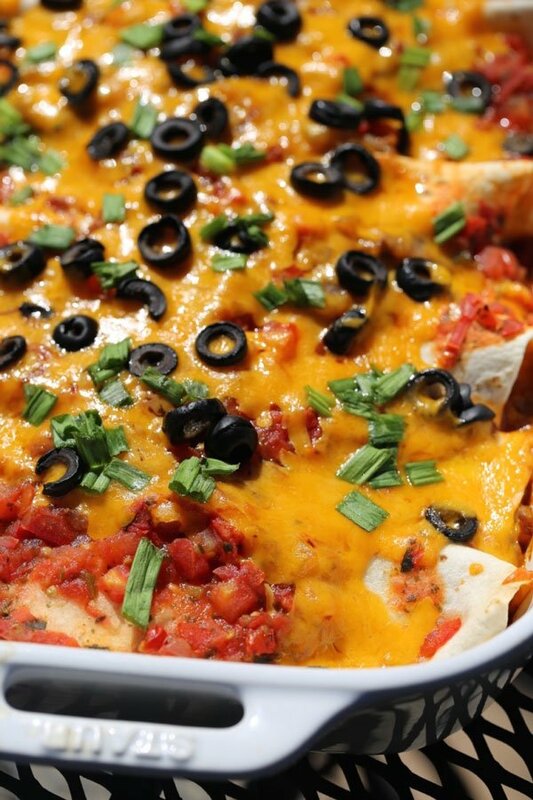 When ready to eat, keep aluminum foil on and place frozen enchiladas into oven to cook for 30 minutes. Cook uncovered for 15-20 minutes until cheese is bubbly and melted. This turned out really well. I made a few modifications to match the ingredients that I had. I’m so glad you enjoyed it! 🙂 Your modifications sound fantastic. I’ll have to try a few of those as well. Love the adding cream cheese idea to the beef. Sounds yummy😀 I don’t know people try to make a recipe of they are going to change everything in it. I love getting recipes that are tried and true because others have screwed them up before! I agree. Tried and true are the best, but I think slight modifications can be fun too. Thanks so much for checking in! I just made this for my husband and I and we loved it. We used ground turkey though. Next time, I’ll use the ground beef as you recommend. This is definitely something we’ll make again. Easy and delicious.